MARI LUZ CORTES : LIST OF MCCANN VICTIMS: A possible sighting of Mariluz in Italy sent her father Juan José Cortès heading for Naples....Any sightings of Madeleine have had the opposite effect on the McCanns....they laugh and smirk at each other !!!!! A possible sighting of Mariluz in Italy sent her father Juan José Cortès heading for Naples....Any sightings of Madeleine have had the opposite effect on the McCanns....they laugh and smirk at each other !!!!! Interpol is reported to be investigating whether a girl found in Naples could be that of the missing five year old youngster from Huelva, Mari Luz Cortés.The Government delegate in Andalucía, Juan José López Garzón, has today said that there was no confirmation of the identity as yet. It seems the investigation started when a Spanish businessman of Italian origin, and resident of Cataluña was alerted by his mother who still lives in Italy, that they had found an indentified girl in Naples who was no older than five and whose origin and identity was unknown. It’s also reported that the child cannot speak Italian and is in a state of shock, only repeating the word ‘mama’. Despite latest reports that the child has an Asiatic appearance, Mari Luz’s father is reported to be planning to leave for Naples. Mari Luz was last seen when she left her home in the El Torrejón district of Huelva on 13th January to buy a packet of crisps at the local sweets kiosk. Several searches in the Huelva area have proved fruitless and did not result in any clues. The Mari Luz case has resulted in considerable coverage in the British press looking for links to the Madeleine McCann case, given that Huelva is close to the Portuguese border. Authorities in Italy say the unidentified child found in Naples is not Mari Luz, the five year old girl who has been missing from her home in Huelva for more than six weeks. The child in question is in a care centre in the Italian city, is said to be no older than five, and cannot speak Italian. 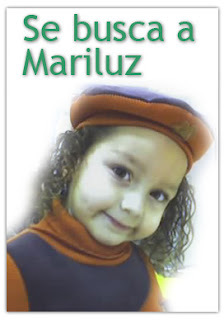 She was reported to be in a state of shock, only repeating the word, ‘mama’.Authorities there have now received a photograph of Mari Luz and say there is no similarity in the two girls’ appearance. The investigation began when a Spanish businessman of Italian origin who is resident in Cataluña was told by his mother in Italy that an unidentified girl had been found in Naples. She was said to be either Asiatic in appearance, or of gypsy race, as is Mari Luz. EFE said the news that the child is not Mari Luz came through from sources at the Spanish Embassy in Rome shortly after Mari Luz’s father, Juan José Cortés, had left for Naples to follow up the initial information.